The Health Insurance Portability and Accountability Act of 1996 (HIPAA) was designed to establish standards and requirements for electronic transmission and storage of certain healthcare information used by healthcare providers, health plans and business entities involved in healthcare. What are the main objectives of HIPAA ? To allow patients to carry insurance coverage to different plans if they change employment (portability). To establish uniform standards for electronically stored and transmitted healthcare data. To improve efficiency of sharing health information among entities involved in healthcare. What is the motivation behind HIPAA ? The first part of HIPAA provides portability of healthcare coverage (moving coverage from one health plan to another). Portability increases costs with paper-based records. Moving large amounts of information on paper is time-consuming and expensive. Portability costs can be reduced by using electronic means to exchange healthcare information. Healthcare information exchanged electronically requires protection. HIPAA rules delineate standards for security and privacy of individually identifiable health information. Electronic exchange of healthcare information will require standardized transactions among healthcare providers, health plans and other groups that use healthcare information as part of their business. HIPAA rules delineate standards for electronic transactions. HIPAA provides a balance between access and privacy. Unlimited access to information precludes confidentiality while complete privacy hinders access to information. What rules are defined in HIPAA ? There are three main rules that outline HIPAA’s implementation requirements. The Privacy Rule focuses on when and to whom conﬁdential patient information can be disclosed (compliance date: April 14, 2003). The Transaction Rule addresses technical aspects of the electronic health care transaction process and requires the use of standardized formats whenever health care transactions, such as claims, are sent or received electronically (compliance date: October 16, 2003). 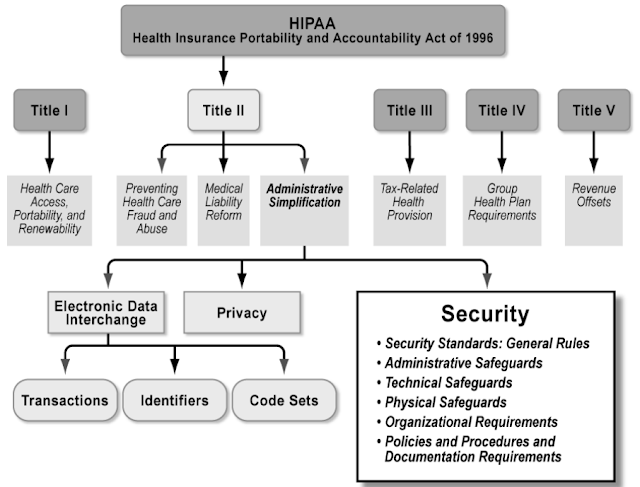 What is HIPAA Security Rule ? Like the Privacy Rule, the Security Rule applies when a psychologist transmits information in electronic form in connection with a standard transaction (see Triggers on the next page). What electronic transactions are covered under the Security Rule ? What is required by the Security Rule ? The Security Rule requires that steps be taken to ensure. The conﬁdentiality of electronically transmitted or stored protected health information (EPHI). How's the Security Rule organized ? The Standards are organized into three categories. Administrative Standards : address the implementation of ofﬁce policies and procedures, staff training, and other measures designed to carry out security requirements. Physical Standards : relate to limiting access to the physical area in which electronic information systems are housed. Technical Standards : concern authentication, transmission and other issues that may arise when authorized personnel access EPHI via computer or other electronic device. What it takes to be compliant with HIPAA Security Rule ? Compliance with the HIPAA Security Rule requires that a psychologist undertake a process by which he or she analyzes and documents each step that has been taken to become compliant. That means that for all Security Rule Standards and Implementation Speciﬁcations, psychologists must develop and maintain a policies and procedures document in written or electronic form, that explains how he or she has complied with each step of implementation. This document must be retained for six (6) years from either the date it was created or the date it last went into effect, whichever is later, and the document must be made available to those persons responsible for implementing the procedures. These Policies and Procedures must be promptly updated to comply with any changes in the law or any changes in how you plan to comply with the Standards. Who needs to HIPAA compliant ? 164.308(a)(3)(i) Workforce Security: Implement policies and procedures to ensure that all members of its workforce have appropriate access to electronic protected health information, as provided under paragraph (a)(4) of this section, and to prevent those workforce members who do not have access under paragraph (a)(4) of this section from obtaining access to electronic protected health information. 164.308(a)(3)(ii)(A) Authorization and/or Supervision (A): Implement procedures for the authorization and/or supervision of workforce members who work with electronic protected health information or in locations where it might be accessed. 164.308(a)(3)(ii)(B) Workforce Clearance Procedure (A): Implement procedures to determine that the access of a workforce member to electronic protected health information is appropriate. 164.308(a)(3)(ii)(C) Termination Procedure (A): Implement procedures for terminating access to electronic protected health information when the employment of a workforce member ends or as required by determinations made as specified in paragraph (a)(3)(ii)(B) of this section. 164.308(a)(4)(i) Information Access Management: Implement policies and procedures for authorizing access to electronic protected health information that are consistent with the applicable requirements. 164.308(a)(4)(ii)(A) Isolating Health Care Clearinghouse Functions (R): If a health care clearinghouse is part of a larger organization, the clearinghouse must implement policies and procedures that protect the electronic protected health information of the clearinghouse from unauthorized access by the larger organization. 164.308(a)(4)(ii)(B) Access Authorization (A): Implement policies and procedures for granting access to electronic protected health information, for example, through access to a workstation, transaction, program, process, or other mechanism. 164.308(a)(4)(ii)(C) Access Establishment and Modification (A): Implement policies and procedures that, based upon the entity's access authorization policies, establish, document, review, and modify a user's right of access to a workstation, transaction, program, or process. 164.308(a)(5)(i) Security Awareness and Training (R): Implement a security awareness and training program for all members of its workforce (including management). 164.308(a)(5)(ii)(A) Security Reminders (A): Periodic security updates. 164.308(a)(5)(ii)(B) Protection from Malicious Software (A): Procedures for guarding against, detecting, and reporting malicious software. 164.308(a)(5)(ii)(D) Password Management (A): Procedures for creating, changing, and safeguarding passwords. 164.308(a)(6)(ii) Response and Reporting (R): Identify and respond to suspected or known security incidents; mitigate, to the extent practicable, harmful effects of security incidents that are known to the covered entity; and document security incidents and their outcomes. 164.308(a)(7)(i) Contingency Plan (R): Establish (and implement as needed) policies and procedures for responding to an emergency or other occurrence (for example, fire, vandalism, system failure, and natural disaster) that damages systems that contain electronic protected health information. 164.308(a)(7)(ii)(A) Data Backup Plan (R): Establish and implement procedures to create and maintain retrievable exact copies of electronic protected health information. 164.308(a)(7)(ii)(B) Disaster Recovery Plan (R): Establish (and implement as needed) procedures to restore any loss of data. 164.308(a)(7)(ii)(C) Emergency Mode Operation Plan (R): Establish (and implement as needed) procedures to enable continuation of critical business processes for protection of the security of electronic protected health information while operating in emergency mode. 164.308(a)(7)(ii)(D) Testing and Revision Procedure (A): Implement procedures for periodic testing and revision of contingency plans. 164.308(a)(7)(ii)(E) Applications and Data Criticality Analysis (A): Assess the relative criticality of specific applications and data in support of other contingency plan components. 164.312(a)(1) Access Control (R): Implement technical policies and procedures for electronic information systems that maintain electronic protected health information to allow access only to those persons or software programs that have been granted access rights as specified in § 164.308(a)(4). 164.312(a)(2)(i) Unique User Identification (R): Assign a unique name and/or number for identifying and tracking user identity. 164.312(a)(2)(ii) Emergency Access Procedure (R): Establish (and implement as needed) procedures for obtaining necessary electronic protected health information during an emergency. 164.312(a)(2)(iii) Automatic Logoff (A): Implement electronic procedures that terminate an electronic session after a predetermined time of inactivity. 164.312(a)(2)(iv) Encryption and Decryption (A): Implement a mechanism to encrypt and decrypt electronic protected health information. 164.312(b) Audit Controls (R): Implement hardware, software, and/or procedural mechanisms that record and examine activity in information systems that contain or use electronically protected health information. 164.312(c)(1) Integrity (R): Implement policies and procedures to protect electronic protected health information from improper alteration or destruction. 164.312(c)(2) Mechanism to Authenticate Electronic Protected Health Information (A): Implement electronic mechanisms to corroborate that electronic protected health information has not been altered or destroyed in an unauthorized manner. 164.312(d) Person or Entity Authentication (R): Implement procedures to verify that a person or entity seeking access to electronic protected health information is the one claimed. 164.312(e)(1) Transmission Security (R): Implement technical security measures to guard against unauthorized access to electronic protected health information that is being transmitted over an electronic communications network. 164.312(e)(2)(i) Integrity Controls (A): Implement security measures to ensure that electronically transmitted electronic protected health information is not improperly modified without detection until disposed of. 164.312(e)(2)(ii) Encryption (A): Implement a mechanism to encrypt electronic protected health information whenever deemed appropriate.